Hate camping just because you miss your cozy bed at nights there? What if the same comfort level is provided to you at the camps? Yes, the sleeping cots are what would help you out during outdoor camps. 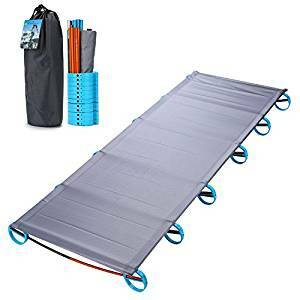 These portable beds are quite popular among the camping lovers as it is quite easy to carry as well as can provide you with a homely feeling during nights. Not only for camping, but the sleeping cots have also found a place in hotels and homes in the form of extra bed whenever required. Read our latest guide about the best latex mattresses. What is a Sleeping Cot? Reasons to buy a Cot? 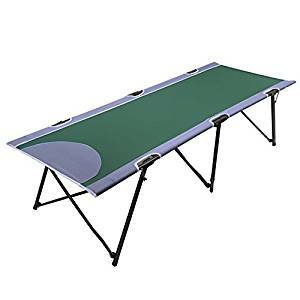 Sleeping Cot, also known as camping cot, folding cot, camping bed, and whatnot is nothing but small beds that are portable and can be used as a supplement to large beds. Very light in weight, they are generally given either a wooden frame or metal frame and given a covering of polyester, nylon or canvas. As they are light to carry and come with easy folding, they are widely used for camping, trips, at home or even in hotels. It is simply a perfect match for the people who love to be outdoors. 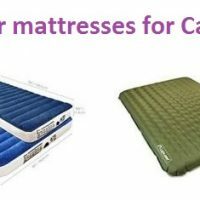 Read our complete guide about the best mattresses for camping. This short-term solution is also getting popular in homes where they would provide the required comfort to the guests. Due to the comfort levels, it comes with; they are also used in several hotels in the form of an extra bed at an affordable price. Whether it is winter, summer or monsoon, there are a number of sleeping cots available in the market with different amazing features to suit your requirements. Thinking why would one prefer looking for the best sleeping cot? Here are some of the prime reasons for the same. Have you ever tried carrying an airbag, a sleeping pad or sleeping bag? If yes, you might know that they are quite less bulky as compared to the sleeping cots. So, thinking why to go for the sleeping cot instead of all those? The prime reason to go for the sleeping cot is that it would keep you off the ground while sleeping. While going for camping or trips in the forest or wood side, you might have observed a number of different small tiny insects, scorpions, snakes, and more such ground specimen that would be roaming here and there. They can end up biting you further leading to bad injury or even death. In such situations, the sleeping cots are the best options to enjoy your trip as well as remain safe from such insects and killer animals. It keeps you a level elevated from the ground giving you a homely feeling. Have you ever tried camping when the weather is hot? During the summers, even at night, the land or ground remains somewhat warm that might be harmful to the health. Again, this would interrupt your sleep as well. But camping with sleeping cots would keep you cooler as it keeps you higher from the warm grounds allowing required air to circulate from all around. This would help you with sound and uninterrupted sleep for hours. This was about the camping site. But did you know, the sleeping cots can also be used at your home and doesn’t require any high shelves to wait for their turn to be used again? The lightweight and foldable sleeping cot can be placed at any handy corner to be easily used when suddenly folks or guests turn up to your place. The sleeping cots are also used in gardens for enjoying the atmosphere while you read or listen to music, and even on pool sides for taking a sunbath. Hence, no matter it is called a sleeping cot, it is a multipurpose bed that comes with a variety of uses for your comfort. Last but not least, the sleeping cots compared to other sleeping bags come with an affordable price. Available in a variety of color, shapes, and size you can select the one favorable according to your interest and pay a very minimal price for the same. Shopping for a sleeping cot is not as easy as you are thinking. You need to consider a few important things which need to be checked out before you invest in one for yourself. To make your selection easy, here are some essential factors considering which you would be able to get a perfect cot for yourself. The cots are available in various fabrics. But the best ones are made out of polyester or nylon. These fabrics are widely selected as they help in keeping you warm while you rest. Also, the canvas is yet another fabric that can be looked for. However, the cots made out of canvas are quite heavy. So, if your camping includes too much walking or trekking, better avoid canvas. Compared to nylon and polyester, the canvas is too difficult to maintain and clean which makes it a less opted option to go with. What kind of frame does it have? Not only the fabric, but the frame is equally important while you are selecting a cot. The frames of the cots need to be light in weight, resistant to rust, and durable as well. Camping requires a sturdy frame due to which people go for steel frames instead of aluminium as they support heavy loads. Again, while selecting the frame, it is advisable to take a review of the manufacturer as they would guide you with the proper weight to be carried in camps. The frames should consume less space and should also be easy to fold after use. Make sure to check out the joints of the bed to avoid any kind of poking while you rest on the bed. This kind of legs is mostly chosen for beds that can be folded around 2 to 3 times easily. This kind of frame legs come with underneath folding which also distributes the weight of the cots evenly while carrying the bed on camps. Such beds are used for indoor use like inside the camps, houses, hotels, etc. where due to the shape of the legs, less stress is levied on the ground or the carpet. If you are a beginner in camping, go for the U-shape legs for sure. 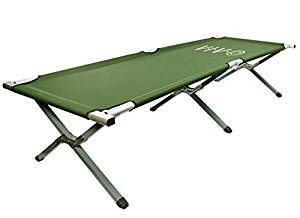 These are the common types of sleeping cots, widely used by the army men. Available in a number of sizes, they are much favored for camping. With X-shape legs, they provide with comfort similar to the king size beds. Due to its typical leg size and shape, they are robust enough to carry heavy weights. As the assembling is a little tricky due to is leg shape, make sure you look for the reader menu in the initial usage. Apart from all these, other things that need to be considered include the insulation and the size of the bed. The number of sizes it comes with would give you the best bed according to your sleeping patterns. Hence, there are various sleeping cots available that would surely confuse you while investing in one. Looking for a comfortable indoor bed while you are out on trips? The Coleman Airbed Cot with Side Table is what you would not be able to ignore. 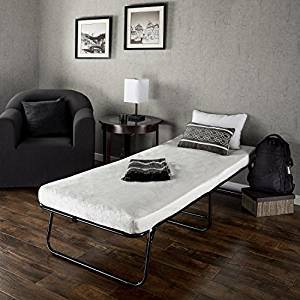 Best for both indoor and outdoor use, the bed is available in two different sizes, the Queen size, and the Twin size, out of which, the Queen size is capable of carrying two adults at a time. With easy inflating and deflating through a 4D pump powered by the battery, the user can easily enjoy elevated support for sleeping. To help you with utmost support and comfort, the bed is designed with ComfortStrong mattress coil. The design of the bed is also given an AirTight system that provides with Double Lock valve preventing the leakage of the mattress. For those who want to use it separated, it is easy to separate the cot and the bed which provides with dual sleeping space. As the Coleman Airbed Cot with Side Table is the best for both indoor and outdoor use, it is light in weight which adds to its portability. Again, the bed comes with a durable bag for easy transporting and safe storing too. Coming to the sizes, it comes with; the company provides with two sizes to select from namely the Queen Size and the Twin Size to select from. The Queen size comes with a height of 6 inches that can carry about 600lbs weight. While the Twin size is also 6 inches tall but supports the weight of the only 300lbs only. Both the beds provided by Coleman come with steel frames, with nylon sewed covers and steel tables too. The mattress of the bed is given a Double Lock too for sealing it from any kind of leakage. Coleman provides equipment and materials required for an outdoor experience. In other words equipment and gear needed for camping, hiking and the like are sold by the brand. In the camping furniture category, they offer products like airbeds, cots, tables and chairs. The ComfortSmart Deluxe Cot has a coil suspension system along with a thick foam mattress that gives an experience that is close to a real bed. Moreover, it is compact and can be folded to fit in small spaces like a car’s trunk. The folding frame is made of steel and can hold more than 250 pounds of weight. It comes with a 1-year limited warranty. The cot has a coil suspension as well as a foam mattress pad which provides maximum comfort in an outdoor setting. The frame is made of steel, and it can support a weight of 275 pounds. 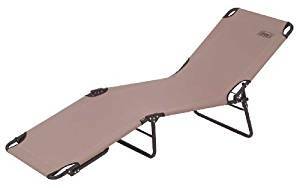 The sturdy cot is good for a heavy person or a tall person, who wanted to camp outdoors. The cot legs are designed to hold up the structure, for comfortable sleep in the outdoors. The cot is foldable, and the size is such that it can fit in the trunk of a car. It weighs around 19 lbs., so carrying it physically may be an issue. The cot easily unfolds to form the base structure, and you need to attach the mattress on top. Similarly while folding it back, you need to remove the mattress and then fold it back in. Not the best option to add and remove the mattress separately, but the mattress adds the needed comfort. The cot-size is 69 x 25 x 15 inches, and the weight is around 20 pounds. It fits people as tall as 5 ft. 7 inches and supports a weight of around 300 pounds. The cot frame is made up of steel. Hence the frame is strong and will support heavy weight. 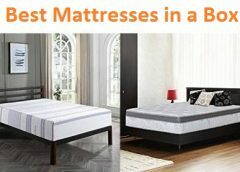 It has coil support as well, and the mattress is made of foam which is durable and light. The foam mattress also makes it very comfortable to sleep on, without the chance of deflating. Tall and heavy people can fit in the cot comfortably. KingCamp is an Asian company, headquartered in Beijing that offers gear for outdoor activities. They manufacture and distribute equipment all over the world. The Ultralight Compact cot is a versatile product that can be used for outdoor activities or at home. It comes packed in a tube-like pouch that is small and can be stored anywhere. It can fit into suitcases as well. It is collapsible and lightweight but lies only a few inches above the ground. 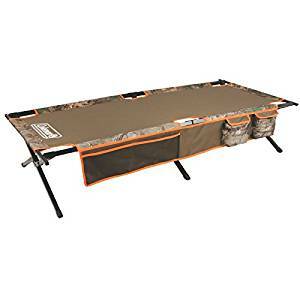 This cot is great for hiking, camping, backpacking and other outdoor events. The KingCamp Ultralight Compact cot can support a weight up to 265 lbs. and it is made of durable, ripstop, 420D polyester fabric. It comes with two elastic straps to stop the mat from slipping. The cot can accommodate persons as tall as 6 feet 2 inches. Eight plastic feet are evenly distributed to support your weight. This ensures that the cot does not fall over. The whole cot is collapsible and fits into a compact 36 x 13 cm bag. It weighs just 4.4 pounds. Because of its small compact storage size and lightweight you can carry it anywhere, even when you are cycling. The assembly is very easy and can be done within a reasonable time. The weight of the cot is 4.4 lbs., while the size is 75 x 25 x 4.7 inches. However, the packed size is 14 x 5.1 x 5.1 inches. The frame is made of aerial and durable aluminium alloy. Polyester fabric makes up the rest of the cot. This fabric is ripstop and tough, ensuring durability in case of rough use. Extremely lightweight, strong and durable. Compact, versatile and easy to set up and clean. Eight plastic feet for even weight distribution. Too close to the ground. There is no mattress, may not be comfortable for everyone. The latches for the legs may be hard to operate. Zinus offers mattresses, beds, bed frames and sofas for home interiors. It is perfect for guests staying overnight and is compact making it easy to store in closets. It has a 1-year limited warranty and can be folded to carry in the trunk of your car as well. It has a 3-inch mattress and a steel frame. The mattress has 2.5 inches of pressure relieving comfort foam and 0.5 inches of fiber padding. The foam is CertiPUR-US certified. The mattress is 3 inches thick and durable. It has a pressure relieving comfort foam layer. There are 2.5 inches of the pressure relieving foam while the remaining 0.5 inches is of fiber padding. The comfort foam ensures you get a good night’s sleep. The cot can support a total weight of 250 pounds, and heavy as well as tall people can snooze on this. The Zinus Traveler Elite needs just to be unfolded, and it is ready to be used. When not in use, fold in it half for storage. There is no setup or attachment of mattress needed. Easy to store in the care in case you need to be going someplace that needs a bed. However, it may not fit in a hatchback trunk. The Traveler Elite has a steel folding bed that is 14 inches high. Its complete dimensions are 31 x 75 x 17 inches. It can support a weight of 250 pounds. The foam used on the mattress is CertiPUR-US certified, and the bed frame is made of quality steel. The foam and padding in the mattress make it comfortable to sleep on. The steel frames make the bed sturdy. Pressure relieving mattress and CertiPUR-US certified. Strong steel frame and lightweight. There may be some issues with the mattress stitching. The mattress may be too thin for some people to sleep comfortably. Another cot from Coleman is the Trailhead Cot. It is a portable and collapsible cot, with the width of a standard bed. It is 17 inches above the ground with a steel X-frame. This is designed after a military-style cot, and it has an extra wide design. The fabric is the camouflage style, and the bed has six legs with four side poles. The bed can be packed into carrying bags. There are side pockets through the length of the cot, which comes in handy when you are outdoors and have things to keep close by. Coleman Trailhead II comes with a limited 1-year warranty. The cot is made of sturdy and durable materials that will provide comfort and longevity. It is wider than the standard cots that are available in the marketplace. It can accommodate people up to 6ft 2in and those weighing around 300 pounds. It is safe to say that the tall people can sleep in this cot without worries. The cot is easily foldable and can be placed in a carry bag for travel. The assembly is easy and can be completed without taking much time. Although assembly is quick, the covers may be tight for first-time use, requiring some time to adjust. The cot dimensions are 75 x 35 x 17 inches and can support weight up to 300 pounds. The standalone weight of the cot is 17.7 lbs. The frame is made of sturdy steel, and the cot cover has nylon in it. The cover has a camouflage design and pockets along one side of the cot. Wide body and side storage pockets for gear. It comes with a warning of exposure to DEHP. Little heavy compared to other brands in the market. The cover may be tight when new and stretch over time. Based in Utah, Teton Sports offers gear for outdoor activities. Their products range includes sleeping bags, backpacks, tents, cots, camping pads, hammocks and related accessories. Teton offers the Adventurer Camp Cot for outdoor sleeping. It is well-built, comfortable and durable. It is easy to maintain and assemble. The 600D Oxford canvas is a good sleeping surface, and it is easy to clean. The feet of the cot has rubber so that it does not tear the tent floor. The whole cot fits into a drawstring bag, after folding. 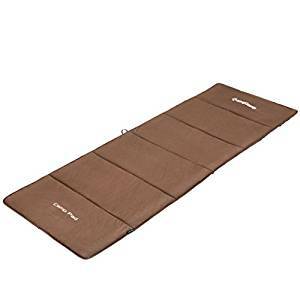 It is recommended that a Teton Sports Camp pad be used along with the cot for maximum comfort. It has a limited lifetime warranty, and the retailer supplies spare parts too. Car campers and families love this as it can be carried in a car and two cots can be attached to make a larger cot. The Teton Sports Adventurer Camp Cot can support a weight of 400 pounds. The canvas material is durable and stretchable that suspends the weight from the frame for a comfortable sleep. The cot frame is composed of steel and is strong to hold up the human body. The cot can be folded and stored in a bag for transport or storage. You can slide two cots together to get a double cot. The assembly is simple, and Teton Sports has “how to” videos to help in assembly. Although the assembly is easy, there have been some complaints about the difficulty of getting the legs in place. The setup dimensions of the cot are 75 x 25 x 17 inches, and the stored dimensions are 38 x 8 x 4 inches. Its total weight is 20 pounds. The cot frame is made of reinforced steel that makes it sturdy. The sleeping surface is made of heavy-duty 600D brushed poly canvas. The surface is durable, sturdy and can be cleaned easily. Availability of spare parts and limited lifetime warranty. The cot is portable and easy to store. Rubber feet for protection of tent floor. Difficulty in snapping the legs in place. The canvas material may tear in the long term. Portal Outdoors has a range of outdoor and camping products on offer. Everything from beds, furniture to tents are developed and sold by Portal. Portal Folding Portable Camping Cot is made of steel and has a durable 600D canvas top. The cot can be folded and fits into a carrying bag for easy storage and transport. It supports a weight of 300 pounds and is perfect for campers or house guests. The cot eliminates the need to sleep on the ground, safe from hard rocks and insects, if you are out camping. There is no assembly needed, it just unfolds, ready for use. The cot is strong and durable, being made of steel and the durable oxford canvas. It can support a total weight of 300 lbs. The fabric is stretchable, to suspend when you lie on it, giving you comfort while you sleep. Portal Folding Portable Camping Cot can be easily folded and put into the bag that comes with the product for easy carriage and storage. The cot doesn’t need to be assembled and can be used simply by unfolding it. The Portal Folding Portable Camping Cot has a dimension of 75 inches in length, 25 inches in width and 18 inches in height (75 x 25 x 18). It is a full adult sized cot with a weight of around 18 to 20 pounds. A bit heavier to carry while hiking, it can be easily stored in a car for travel. The folded item measures 38.5 x 5.5 x 7 inches. The frames are made of high carbon steel in the Portal Folding Portable Camping Cot, along with powder coating that protects the frame from the harsh weather outdoors. The sleeping surface is made of oxford canvas polyester and is durable to support the suspended weight. The fabric is super easy to clean too. Quick setup and no assembly required. Compact and easy to carry or store. Fabric on the surface may not provide back support. The weight of the product may make it difficult to carry without a car. Yahill’s Ultralight Cot is great for camping or hiking, especially so as it can be easily folded and fits in a small duffel bag. It is easy to transport or store in your house. It is light, with a weight of 4.73 pounds, thus making it easy to carry in a backpack too. It can support a weight of 260 lbs., less compared to some other products in the market. The sleeping surface has extra holes, so heavier and larger people can order extra legs and tubes to support the cot. The foot and support rods are connected, so the time required in assembly is lesser. The legs are skid proof, and the sleeping surface is waterproof polyester. The frames are made of strong aluminium alloy. The sleeping surface is polyester that is waterproof and sturdy. It comes with a pillow and a side pocket near the sleeping surface so you can keep your gear while sleeping. There are extra holes along the sleeping surface in case you need more legs to support the cot. The fabric is comfortable to sleep on, but over time it may sag, creating a problem for back support. The Yahill Ultralight fits into a small bag after being folded and can be easily stored or carried. It has a weight of around 3 pounds and can be moved around easily. The assembly instructions are included in the package. The Yahill Ultralight measures 70.8 x 22.8 x 3.9 inches and weighs around 4 to 5 pounds. The frame is made of aluminium alloys while the sleeping surface is made of polyester canvas that is waterproof. The cot is strong and makes for a good option while outdoors. The legs are skid proof. The pillow can be used as a storage bag too. The material may sag from use. Too low, close to the ground. There were some complaints about the legs breaking off after two nights of use. Trademark Innovations offers quality Home and Kitchen as well as Sports and Outdoors products. 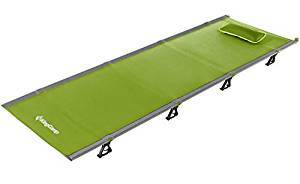 The Portable Folding Camping Bed and Cot from Trademark Innovations is a light bed that can be used for camping or extra house guests. It will keep you comfortable and above the ground from rocks and bugs on your outings. The cot can be used in open air or inside a tent. It is portable and can be folded to fit in a bag. The best feature is that there is no assembly needed. All you need to do is unfold it, and it is ready for use. It is suitable for children and adults and can support a maximum weight of 260 pounds. The steel frames provide good support to the human body, and the fabric on top supports the weight. Overall it is good on comfort level for an outdoor trip. The Trademark Innovations Portable Folding Camping Bed & Cot does not require any easily. Just take it out of the bag, unfold it and voila! It is ready for use. The cot is foldable into half its size and fits into a bag easily and can be carried around. The cot measures 75 inches long, 17 inches high and 25 inches in width while having a shipping weight of 13.3 lbs. The frames are made of steel which ensures durability and strength. The sleeping surface is made of durable stretch polyester fabric which can hold a body’s weight. Overall, it has good construction for outdoor use. The folded cot is easy to carry. Well above the ground and lightweight. The aluminium casing may flake off on the cot. Some complaints of breakage immediately after purchase. The Camping nights are the most uncomfortable nights on outdoor travel. Sleeping on the ground or pad or mattress should be of utmost comfort while on adventurous outdoor travel. The camping cots are one of those blessings in disguise for frequent outdoor camping travellers. These cots help to wake you up refreshed and cheerful for the next day! The camping cots are not only suitable for base camping, hiking or mountaineering but can also be used as a spare bed when you are running with a guest at home! The MARCHWAY Ultra Light Folding Tent Camping cot has all the features which one needs on a camping night. Let us go through some of them. The size of the cot bed is the best fit for most of the people. The arms and other body parts can perfectly fit in without having the crowded or awkward feeling. The MARCHWAY cot bed has 5 rods which are heavy and supports the cot surface without having any types of sags. It also has 10 anti-skid feet which help in consistently holding the bed tight. The design is off the ground and helps in keeping the moisture and wetness of the ground away. The cot bed is portable and can be carried anywhere around easily. The setup is quite simple and easy. It has an aluminum shock cord pole design which is foldable and can be easily assembled. It takes a few minutes to assemble and disassemble the cot quickly. The weight of the cot is 4.5 pounds, and the size is 16.9*5.5 inches. This size and design can be easily fitted to the travel bag. This cot is perfect for activities like camping, trekking, hiking, and more adventures. The cot bed is made up of high-grade aluminum legs, and the fabric is ripstop nylon. This material is quite durable and helps keep the cot sturdy up to 300 pounds. It is an authentic design and has portable and comfort features. It is ultra light and easy to carry. The legs of the cot are not easily adjustable. Sleeping cots are used for various reasons for indoor as well as outdoor activities. A cot helps us in serving the guest in our home as well as serves our comfort in a good night’s sleep while on the outdoor adventures! Just because it is a temporary solution, it doesn’t mean that it can’t have all the comfort and support. The best available cots provide you with comfort and are durable. These cots can be carried easily even at the mountain climbing or in the sea sports. The Moon Lence Camping cot provides you with a short-term solution in any adverse conditions and is the most reliable cots. Let us walk through some features and specifications of the Moon Lence cots. The Moon Lence Camping cots are comfortable and hygienic (can be cleaned easily). 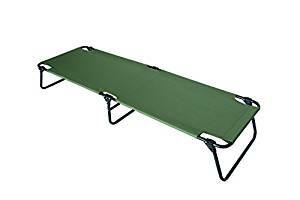 You can lay comfortably on the cots as it gives you the support off the ground. With that extra comfort, one wakes up refreshed and amazed. The Moon Lence camping cots can be folded and assembled within minutes. It becomes incredibly easier to carry the camping cots with its portable design and lightweight. It doesn’t require any extra tools and types of equipment. The set up is simple and easy to place on. The size which can be unfolded is a 74.8*27.5*6.7 inch. The cot is breathable and has a waterproof surface. The total weight of the bed is 4.1 lbs, and it can hold up to weight 160 kg. This cot is also used in wide field applications. The material is high strength 7075 aluminum alloy. It has 420 D polyester fabric and can hold up to 350 lbs. The material is durable and is made up of high-quality fabric. The pillow can also be used as a storage part. It can be used in various activities like hiking, camping, motorcycling, driving etc. It should not be used on anything rough as it can be torn off. May wear out after a couple of use. A travel cot is a portable bed or a cot bed that can be quickly assembled or disassembled to provide that extra comfort and easy carrying features. Camping or any other activity requires rest at night to sustain the weather conditions and to start another day with a refreshed body. Without proper sleep and rest, the body doesn’t cooperate to perform the activities and task. So, for that essential support and comfort camping cots should be carried along. There are several of the VIVO Camping cots like traveling, camping, lounging or can also be used in daycare for kids. It is constructed and designed in a way that it provides comfort, support, and zeal to enthrall the activity the next day! It consists of rubber-tipped steel legs and aluminum frame which provides comfort and sturdiness. The sturdy frame is water resistant and has a durable construction. The VIVO Camping cots can be folded up and carried effortlessly. The fold up frame consists of shoulder straps which help in carrying the camping cots far miles. The frame can be used for storage and transportation along the travel backpack. The assembling and dissembling are trouble-free and smooth. The size of the cot is 75”L, 25”W, 16” above the ground. It can be folded up into 36*7*4, and the weight of the cot is 12 lbs. The frame is made up of steel material the cot is water resistant and is coated with polyester (600 deniers). The construction material used is high grade and built to last. The material is sturdy, and the frame is simple and portable. It doesn’t last so long. (Not durable for a longer duration). Camping is a great outdoor activity with a comfortable and beautiful experience. Camping needs a whole lot of things to be carried along to make the trip mesmerized. 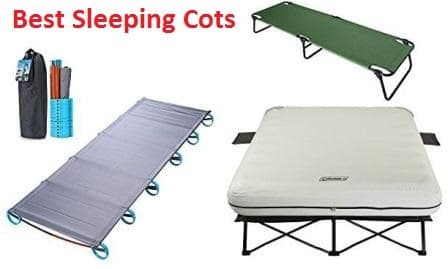 Camping cots are one of those important types of equipment or essentials that need to be picked up (right) to get those dreamy fulfilled nights. The camping cots provide you with a solicited sores and tranquil leisure (if chosen the best one). Campers often travel along the mountains, hills, valleys, roads etc. They need a comfortable sleep when there is a lot of chaos and phobia around. The phobia of bugs, snakes, lizards, and others is often irresistible. All you need is the best camping cots which give you the elevated mood and cheerful next day! 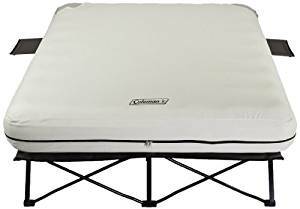 Coleman Converta Cot is the ideal cots when relaxing outdoors. It can be carried in a portable backpack or can also be fitted in the car trunk. Let us check more details about the product. The Coleman Converta camping cots can be effortlessly adjusted with 4 back positions and also 2-foot positions. It gives you the comfort and support which is needed in the outdoors. It gives you comfortable seating or sleeping in the backyards or at the campsite. The Coleman Converta camping cots have a portable design which fits in the car trunks easily. It can be carried easily and assembled and disassembled within a fraction of seconds. The Assembled dimensions of the Coleman Converta camping cot is 76.3*25.2*12.8. The weight capacity of the folding cot is 225 pounds. The overall weight of the cot is 15.5 pounds. The Coleman Converta cot frame is made up of steel. It is made with steel to last long and has that sturdiness. The frame is powder coated and can support up to 225 pounds. It can accommodate people with 6 feet and 6 inches tall. The seating arrangements are quite comfortable and sturdy. The material should be improvised. The product doesn’t come with a carrying bag. There are many campers who wish to feel like home on a camping night. They need a home like comfort and a good night’s sleep on a wilder night. All they need is a camping cot which is rigid and sturdy. It should have great comfort and flexibility to be carried anywhere. The design should be simple and lightweight so that it could be assembled and traveled with several benefits. The tricky question here is which brand or which product meets all the standard requirements? Well, the cot must be easy to set-up, reliable in structure and should contain practicality. The Generic Blue camping cot is one of the camping cots which has no end bars and is easiest to set up. 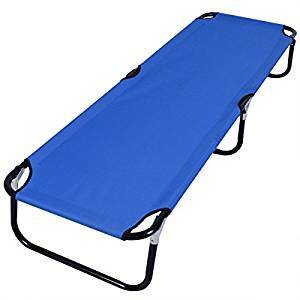 The Generic Blue Folding camping Bed Outdoor Portable Military cot provides roomy dimensions and excellent comfort and support which are needed in a camping or any adventurous activity. The frame is super sturdy and is made up of steel. The sturdiness of the frame helps to avoid wobbling on rough ground. It provides the support as it can be placed off the ground. It is useful for Adults, children, explorers, campers and can also be used in the house (for guest). It is quite portable and can be carried easily around various places. It can be used as storage in means of transportation and travel. The design is authentic and can be swiftly assembled and disassembled. The dimensions of the cot are 74.4”L*22” W*11.8”H. The size which is folded is 37”L*22” W*4.5”H. The weight of the product is 11lbs, and the weight capacity is 330 Lbs. The construction material is 600 D oxford cloth and steel material. This newly designed cot is made up of high quality. This product meets all the necessary features and aspects with affordable price. It can be used for multi purposes (indoors and outdoors). It doesn’t fall off or collapses easily. It has a sturdy frame. It is slightly narrower for the capacity of its weight. 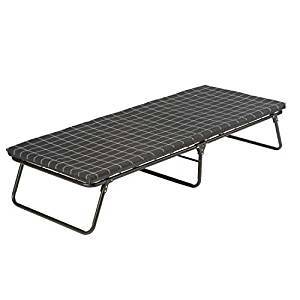 Camping cots are the best companions on camping or wilder nights. Sleeping on a ground level is just the uncalled desire or way to disappoint the hikers, campers etc. 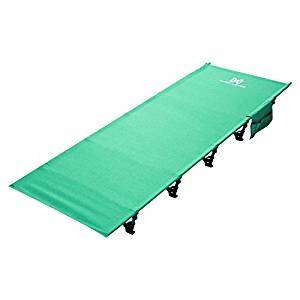 So, camping cots are the most desirable equipment which needs to be carried while traveling outdoors. The camping cots should have a certain set of pyramids which needs to be met. 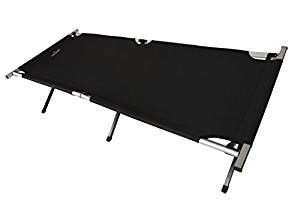 The cots should be easy to set up, should have reliable design and structure, and should be portable and favorable in price. Well, the King Camp Soft Cotton Sports camping cots are the best suitable camping cots which are compact, lightweight and can be washed easily. Let us check more features, size, weight etc. of the King Camp camping cots. The King Camp Soft Cotton sports camping cots have 4 elastic straps on the backside to ensure its stability on the cot. The filling in the bed is cotton which helps you keep warm and gives that coziness and comfort. You can carry a blanket in the tents. It provides support on the ground or above the ground with the help of the material (cotton). The King Camp Soft Cotton camping cots are easily foldable and portable. It can be carried along easily with its compact design. The King Camp camping cots come in two different sizes. The Normal size of the cot is 74.8”*25.2”, and the large size is 79.9”*29.9”. The weight of the normal size is 0.8 kg which is 1.7 Lbs. The weight of the large size is 0.9kg which is 1.9Lbs. This camping cot is bed is made up with cotton filling and has a soft texture. The attached pillow can be used as a storage bag. It can be used in the house as well as outdoors. The cotton-top material is soft and comfortable. This camping bed can be machine washed and can be cleaned easily.